Sport, fun and friendly time... that was the Commençal Days ' program! Back into the images. 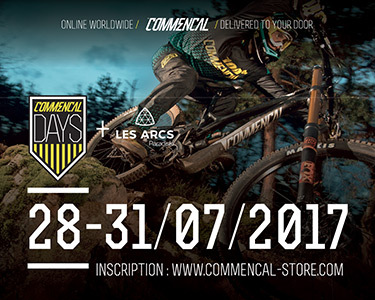 Take advantage of the presence of mountain bike professionals to learn all about the Commençal range of bikes and try them out in natural splendour in the les Arcs/ Peisey-Vallandry Bikepark ! Make a date for 28 to 31 July in Arc 1800. Anne-Caroline CHAUSSON, multiple World Mountain Bike Champion, and the Commençal competition riders will be accompanying you on your test rides. >>	mountain bike based activities. > Please remember to bring with you your identity card and credit card for the security deposit.